I was in the kitchen with my nephew Keaton making homemade chicken soup and trying to create a plan of action for Cael's birthday dinner and cake. I knew that I wanted to make pizzas and a train cake, but there were so many possibilities and so many palates to please, so the decision would require some thought. As I always do before launching into a cooking binge, I loaded up the dishwasher and started a cycle so that I would have a clean sink and could load in the dishes I'd use to be cleaned when I was done. I washed the counter tops and sat down with Keaton to talk about pizza toppings and what everyone would like. "It's okay. I really like cheese." Keaton said. Before I could finish my thought, I noticed that my socks were wet. Like, really wet. I had to quickly analyze the situation. Did I just wet myself? I like pizza, but I'm not pee-my-pants crazy about it. Strike. Did my water break? Nope, not pregnant. Whew. Am I having a psychotic episode? Plausible, but not likely since the boys were napping and I was feeling unusually clear-headed. There was no more time to think as my dishwasher started gushing water out all over the kitchen and my hardwood floors. I was frantically trying to control the flow of water, but as soon as we'd soaked 20 towels and there was still an inch of sitting water, we knew we had a serious problem. I called Papa and begged him to come help me as I didn't know where the water shut-off valve was in the house, and since this wasn't exactly the first time we've flooded our home, I knew he would be familiar with its location. You see, we are flood-prone. Which is especially surprising because we don't live near any bodies of water. But in the three years we've lived in this house, we've had 5 floods, three of which have required emergency efforts to get under control, and three of the five have been caused by this hellish dishwasher. As soon as Papa arrived, he quickly got the water turned off and we began the process of de-sogging the kitchen. We removed the bottom drawers from around the dishwasher and found several inches of water that was contained there. This gave me a thought. If there is this much water in these drawers, where did the rest go? I opened the drawer to the basement spare bedroom, the site of all three flood disasters, but found that everything looked as it should be. Everything did not sound as it should, however. I could hear water pouring, so I checked inside the closet. All clear. I looked at the window and saw water streaming down from the rain outside and thought that perhaps the window wasn't closed properly. But as I neared the window, I found that my very wet socks were squishing into the very wet carpet. It was not until that moment that I realized it was sunny outside and that the water was raining down the inside of the windows rather than the outside. It was also raining from the frame of the closet door as well as from the ceiling fan in the center of the room. LG, we have a problem. There was one brief moment of luck throughout this ordeal. 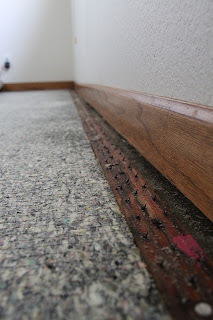 Due to the two previous floods in this room, we'd pulled the carpet away from the tack strips and had never gotten around to having it tacked back down. We quickly rolled the carpet back, set up an intricate system of fans and dehumidifiers and stepped back. What was that?? Was water falling from a new spot in the ceiling? Unfortunately, our momentary luck with the carpet was tarnished when I began to see chunks of the textured ceiling falling off onto the bed. Just like a Magic Eye book, once I saw one wet, wrinkled spot on the ceiling, I began to see 5 more. And then 10 more. And then 15. Back upstairs, Joel arrived after I'd placed a frantic call asking him come home as quickly as possible. He quickly got to work on the dishwasher, trying to locate the source of the problem and discover why copious amounts of water were still weeping from the dishwasher even though the water supply had been disconnected. After throwing up our hands in disgust and deciding instead to create a towel fortress around the dishwasher, we packed up our chicken soup and headed to my sister's house to eat it since there was no running water in my home. Oh No! This sounds like a complete and utter nightmare. I'm empathizing as we had a dishwasher flood but not THIS bad... wow. Ugh, I sympathize with YOU, then! Even if it's not severe, the mere pain of not being able to use the dishwasher is torture. I'm so much lazier than I ever knew!